Absolutely beautiful and very functional 4 bedroom,3 bath, 3 car garage home built by Taylor Morrison. offering almost 2500 sq.ft. of living space with custom touches, arches and upgrades galore all throughout located in gated section of Oak Creek Community in Riverview. 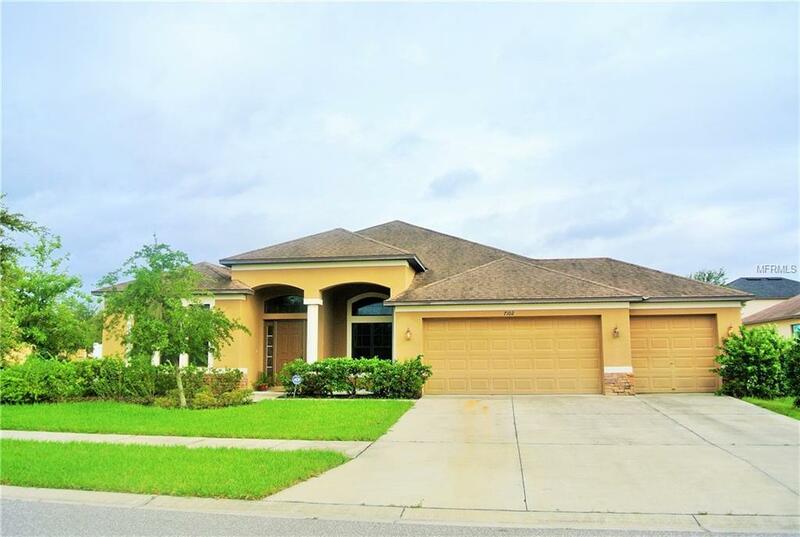 Home features vaulted ceilings, upgraded fixtures, lights and ceiling fans, expansive foyer, very open floor plan and formal living and dining with laminate flooring and ceramic tiles all throughout the home. Kitchen offers granite counters,42" raised panels Cherry cabinets,stainless steel appliances, breakfast bar, nook and pantry. The kitchen opens to a very spacious family room creating an ideal setting for entertaining with sliding glass doors that open onto covered/screened-in porch. Large master suite boasts separate shower and a soaking garden tub with double sinks, huge walk in closets, Cherry cabinets and Corian countertops. Inviting guest bedrooms and baths, split plan makes it a great home for hosting those out-of-town guests. Home has its own laundry room with washer & dryer and located on a totally fenced corner lot. Rent includes lawn maintenance and Pets are OK with some restrictions. No smoking inside the property. Community offers parks and playgrounds! Easy commute to Mac Dill AFB, Tampa, Downtown, Brandon or even St. Pete/Clearwater to enjoy the beautiful white sand beaches. Dont miss this opportunity to live minutes from schools, restaurants, shopping and so much more!! Don't delay make it yours today! Pet Restrictions Pets Okay With Owner Approval. No Agressive Breeds Please!